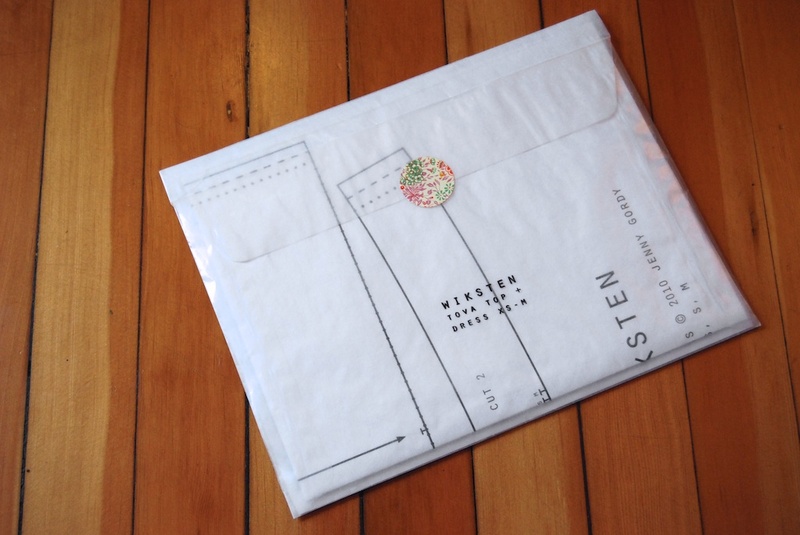 My Wiksten pattern came in the mail today! I'm so excited to have this pattern in hand. This top fits well into my "shapes that work for me" wardrobe acquisition approach, and I've seen so many beautiful versions popping up all over the web. Thanks to other peoples' hard work and creativity, a scroll through that link demonstrates just how varied this top can be with different fabrics or tiny pattern tweaks. I think I could easily have three versions of this in my closet and never get sick of it. So I'm now the proud and happy owner of three patterns; Wiksten's Tova, Colette's Negroni, and Thread & Theory's Jedediah. (Remember that Bolt anniversary sale? Jedediah was 20% off - how could I resist.) The Tova appears to be the easiest - no buttons or zippers, the least number of pieces, partial sleeves - so much to Kai's chagrin I'll probably start there. As soon as it arrived I took it completely out of the package and read the instructions cover to cover. And that's when things got shaky. You guys, I am not a seamstress. I'm really comfortable trying and failing at a wide variety of knitting techniques - every new pattern incorporates some method or skill I've never tried before, and it doesn't make me hesitate in the slightest. I love quilting, and I've yet to meet a pattern or block that strikes fear in my heart (mostly because I am all about wonky, and don't love crisp geometric perfection in my own work, so what is there to fear, really). "My" sewing machine (my generous mother-in-law's sewing machine) is a simple, practical, unintimidating Singer. It sews a straight line like a champ, and for piecing quilts it is more than perfect. But clothes? Clothes are a different story. Button holes I fear. And while I want a serger (seems like the easiest, most professional finishing option) I don't even know where to begin. There's an incredible fabric store here that's a licensed Bernina dealer, and they do both classes and private lessons, which I'm considering. I like the idea of working through this problem first with professional assistance. But the goal is eventually to be able to do this efficiently and elegantly on my own. So what really makes the most sense here? One option is to pinch pennies for a long time and make a big investment, one that will benefit my quilting and clothing. A second option is to take a lesson, learn to use these high-end machines, and then pay a small amount per hour to use them at the store. This seems problematic because I can't show up there in my pajamas, with a cup of tea and my favorite podcast - I won't be in the sew zone, as my talented friend Emily likes to say. But as far as option one goes, I am still technically unemployed and a big investment in one of my too-many hobbies isn't really in the cards right now. So that brings us to option three: something in the middle. A new, inexpensive machine (or just the addition of an inexpensive serger) to start with. In reality, a Bernina is way more machine than I will ever need. And I'm cheap. And I enjoy using tools that are simple, efficient, and not overly complicated - like a knitting needle. But again, here, I'm at a loss. Any of you sewing aficionados on small budgets? I've heard great things about the Brother 1034D serger, and the price is not outrageous. I'll take any advice you have, because I'm dying to cut into my stash and get some new clothes on our hangers. That said, I totally believe in new sewers choosing patterns they actually like, rather than some simple but useless thing (I'm assuming you don't need flannel boxer shorts?). So my advice would be to take the Tova slow, check out some online tutorials when you get stuck, and don't make your first one out of expensive fabric. Hey! I bought this on Amazon, and I have used it A LOT in the past year with no problems. It is certainly a no-frills machine but until I upgrade to a nice ($$$) one this suits me just fine. also-- Colette Patterns has a free Sorbetto tank top which is a good learning piece and uses very little fabric! Hey! Thanks for all the advice - I will definitely try out this pattern, what a great (free) place to start! I really don't WANT to get a new machine - I love my old machine! - but I don't think it can do button holes, which seems like a deal breaker. I'm not positive yet, though - the manual is in storage somewhere, so as soon as we have a place to live and sort through all my junk, maybe I'll be proved wrong ;) one can always hope! if you ever need help, let me know! i hope i wasn't too forward with my suggestions! good luck! You could do the button-holes by hand. Just a needle and a thread. More handywork but a lot less scary. I think it would look very special! Great tip to cook beef prime rib.Most of the time the meats of the ribs take too much time to be tenderized but now with the help of these tips I would be able to make perfect beef ribs.